A hex dump is a hexadecimal view of data. You may wish to use hexadecimal when debugging a program or to reverse engineer a program. For example, many file formats have specific hex characters to denote their type. If you are trying to read a file using a program and for some reason, it isn't loading correctly, it might be that the file isn't in the format you are expecting. If you want to see how a program works and you don't have the source code or piece of software which reverse engineers the code, you can look at the hex dump to try and work out what is happening. Computers think in binary. Every character, number, and symbol is referenced by a binary or multiple binary values. Human beings, however, tend to think in decimal. As humans, our lowest numbers are called units and represent the numbers 0 to 9. When we get to 10 we reset the units column back to 0 and add 1 to the tens column (10). In binary, the lowest number only represent 0 and 1. When we get past 1, we put a 1 in the 2's column and a 0 in the 1 column. When you want to represent 4 you put a 1 in the 4 column and reset the 2's and 1's column. Therefore to represent 15 you would have 1111 which stands for 1 eight, 1 four, 1 two and 1 one. (8+4+2+1 = 15). If we view a data file in a binary format it would be absolutely huge and virtually impossible to make sense of. The next step up from binary is octal, which uses 8 as the base number. In an octal system the first column goes from 0 to 7, the second column is 8 to 15, the third column 16 to 23 and the fourth column 24 to 31 and so on. Whilst generally easier to read than binary most people prefer to use hexadecimal. Hexadecimal uses 16 as the base number. Now this is where it gets confusing because as humans we think of numbers as 0 through to 9. So what is used for 10, 11, 12, 13, 14, 15? The answer is letters. The value 100 is therefore represented by 64. You will need 6 of the 16s column which brings up 96 and then 4 in the units column making 100. All of the characters in a file will be denoted by a hexadecimal value. What these values mean depend on the format of the file itself. The format of the file is denoted by hexadecimal values which are usually stored at the beginning of the file. With knowledge of the sequence of hexadecimal values that appear at the beginning of files, you can manually work out what format the file is in. Viewing a file in a hex dump can help you find hidden characters that aren't shown when the file is loaded into a normal text editor. 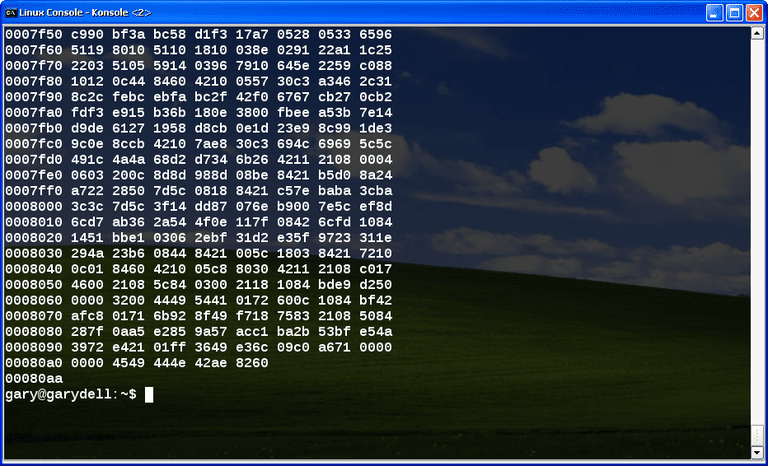 To create a hex dump using Linux use the hexdump command. The default output will display the line number (in hexadecimal format) and then 8 sets of 4 hexadecimal values per line. You can supply different switches to change the default output. For example specifying the minus b switch will produce an 8 digit offset followed by 16 three column, zero filled, bytes of input data in octal format. The above format is known as one-byte octal display. Another way to view the file is in one-byte character display using the minus c switch. This again displays the offset but this time followed by sixteen space separated, three column, space filled characters of input data per line. Other options include Canonical hex+ascii display which can be displayed using the minus C switch and two-byte decimal display which can be displayed using the minus d switch. The minus o switch can be used to display two-byte octal display. Finally the minux x switch can be used to display two-byte hexadecimal display. If none of the above formats suit your needs to you use the minus e switch to specify the format. If you know a data file is very long and you just want to see the first few characters to determine its type you can use the -n switch to specify how much of the file to display in hex. The above command displays the first hundred bytes. If you wish to skip a portion of the file you can use the minus s switch to set an offset to start from. If you don't supply a filename the text is read from the standard input. Then enter the text into the standard input and finish by typing quit. The hex will be displayed to the standard output. The hexdump utility is obviously a fairly powerful tool and you should definitely read the manual page to fully get to grips with all of the features. You would also need a good understanding of what you are looking for when reading the output.